So far in our Elite Status Series, we’ve covered American, Delta, Southwest and United. Last week, TPG contributor Nick Ewen went through the four tiers of elite status in the Dividend Miles program: Silver, Gold, Platinum, and Chairman’s Preferred. Today, he finishes up with US Airways by tackling the unique aspects of the program to help flyers fully maximize their benefits. We’ve already taken a look at the various tiers of elite status in the US Airways Dividend Miles program, including how to qualify for each level and how to maximize the published benefits of each. However, the program also has some unique features that provide even greater potential for travelers, so in this final wrap-up post, I will highlight these things, including alternate ways to earn status (trial, buy-up, and lifetime), the Special Dividends program, and the US Airways credit card. Trial Preferred lets you buy status temporarily then fly to keep it. 1) Only those without status can take advantage of this program (so if you are already Silver, this isn’t a quick way to jump to Chairman’s!). 2) It also isn’t open to those who didn’t qualify for the current year (so if you just dropped from Silver, you can’t use this to get status back on March. 3) Only flights on US Airways and US Airways Express will apply towards the above thresholds. 4) Only flights booked after the status is recognized in the member’s profile will actually reflect the new status. Even with those restrictions, this can still be a nice way to jump to status early, especially if you have a lot of upcoming travel. However, with the upcoming merger with American, this may disappear, but if you act fast and can fly enough to attain Chairman’s Preferred status, that might translate into American Executive Platinum in the newly combined program, though that’s likely a long way off. US Airways lets you buy status outright. 2. Buy-up to Preferred: This one is a bit more complicated, but at the same time, it doesn’t require any actual flying to take advantage of. The US Airways program currently offers any Dividend Miles member (including current elites) to buy-up to the next (or higher) level of status based on their current number of elite-qualifying miles or segments. In essence, this is similar to Delta’s MQM purchase program, and can be a handy way to extend your current status (for those dropping a level or two) without taking a mileage run or to simply outright buy status. Here’s how it works. First, figure out how many elite-qualifying miles/segments you currently have. From January to May, US Airways allows you to use either your previous year’s balance or your current year’s balance. However, from June on, you are required to use the current year’s numbers. Obviously in January, last year’s activity will almost certainly be higher than this year’s balance, but in May, it may not be so cut-and-dry. Chairman’s Preferred: 100,000 miles or 120 segments. Therefore, using the above table, it would cost you $989 to buy-up to Gold Preferred, $1,499 to buy-up to Platinum Preferred, or $2,499 to buy-up to Chairman’s Preferred. There’s no doubt that this would be a pricey proposition, especially since a mileage run can oftentimes net you as many (or more) qualifying miles/segments at a much lower price. However, if you plan on traveling a bunch on US Airways (or even American after March 30) this year, it can be a nice way to immediately begin enjoying status prior to earning it the hard way. It can also be a great way for that last little bump if you are really close to a given threshold, especially because you have until the end of May to decide whether or not you want to do it based on last year’s flying. However, keep in mind that buying up only applies to this year’s status (which ends in February 2015). In order to maintain your status beyond that point, you would need to fly the normally required miles/segments this year (or plan on buying-up to the status again next year). In addition, this is all up in the air after March 30, so I would recommend doing this sooner rather than later. US Airways offers Million Milers lifetime status. In addition to these two “shortcuts” to earning (or moving to a higher level of) status, US Airways also currently offers its Million Mile flyers lifetime status. One you have flown 1 million elite-qualifying miles on US Airways, US Airways Express, and US Airways Shuttle, you will automatically enjoy lifetime Silver Preferred status as long as you remain an active Dividend Miles member. In other words, all you have to do is earn or redeem miles for/from your account once every three years. Unfortunately, partner flights and bonus miles from past promos do not count towards lifetime status, and as of now, there isn’t any way to earn higher levels of lifetime status. However, it’s nice to know that this is an option. 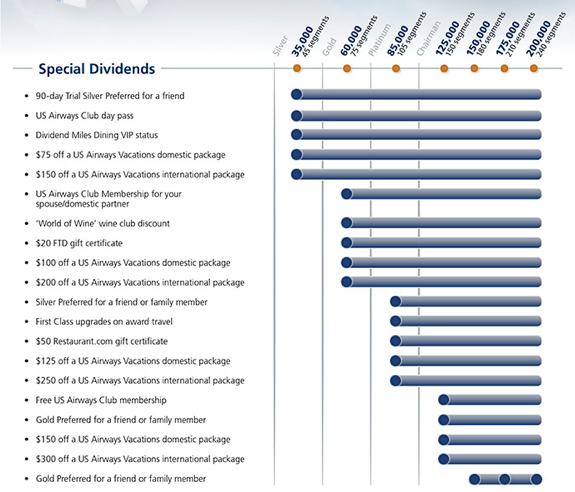 US Airways Special Dividends include bonus perks and benefits for flying above qualification thresholds. Definitely some interesting incentives to keep flying US Airways in between (and above) different status levels. Keep in mind that these are not available to those who purchase (or gain trial) status; it is solely based off your elite-qualifying activity in a given program year. One final way to allow your miles to go even further with US Airways is through their current credit card: the US Airways Mastercard. While things are still being ironed out with the merger, it appears likely that this card will eventually be phased out, as American has already selected Citi as its credit card issuer going forward. However, it is still active and likely will be for some time, though I would definitely recommend getting in on it sooner rather than later. The current offer is 35,000 bonus miles after the first purchase, and cardmembers earn 2 miles per $1 spent directly with US Airways and 1 mile per $1 spent everywhere else. There is an annual fee of $89, but it is waived for the first year with this offer of a 35,000-mile sign-up bonus, but not this one with a 40,000-mile sign-up bonus. 1. 10,000 bonus miles on the account’s anniversary: This can definitely help ease the pain (or cover completely) the $89 annual fee. Those 10,000 miles are almost enough to cover half of a round-trip domestic award ticket. 2. Two annual $99 companion tickets: Two times each year, the cardholder is able to bring along a companion for just $99 on a round-trip coach flight within the continental U.S. and Canada, provided that he/she spent at least $250 on his/her ticket. This is even included during the first year (when the annual fee is waived), so this offers yet another valuable savings opportunity for US Airways travelers. The certificates are valid for a year, but reservations must be booked within 9 months of the issue date. As with all similar offerings on other airlines, this is capacity controlled and will include some additional taxes and fees. 3. US Airways Club pass and discounts: When you first open the card, you will receive a one-day US Airways club pass (valid for one year from the date of account opening) plus a $75 discount voucher towards a new club membership, essentially giving non-Preferred members the same discount offered to Silver, Gold, and Platinum Preferred flyers. 4. 5,000 mile award discount: This is probably one of my favorite benefits of the US Airways Mastercard. For every round-trip or open-jaw award ticket booked on US Airways/US Airways Express flights from the primary cardholder’s account and paid for using the card, you will receive a 5,000 mile discount. For example, if you wanted to redeem your miles for a round-trip flight from West Palm Beach to Phoenix (and you are able to find low-level space), instead of 25,000 miles, you would only need 20,000 miles. This discount will be automatically reflected after you select your desired flights online. This applies to all award tickets booked with the cardholder’s miles and is unlimited, so definitely a nice perk to stretch those miles even further. Remember that partner flights aren’t eligible. 5. Additional elite-qualifying miles and award processing fee waiver: Each calendar year, when the cardholder spends at least $25,000, 10,000 of the miles earned will be converted into elite-qualifying miles, and they will also enjoy waived award processing fees (just like those enjoyed by Gold, Platinum, and Chairman’s Preferred members). This results in a valuable step towards elite qualification and also allows members to save an additional $25-$50 on award tickets in addition to the 5,000-mile discount mentioned above. 6. First class check-in and Zone 2 boarding: For every reservation with the cardholder’s Dividend Miles account number, he/she will be able to use First Class check-in lines and also board with Zone 2, allowing early access to the overhead bin and a chance to get settled on the plane before the rush of other passengers. As you can see, the US Airways Dividend Miles program provides some unique benefits and additional ways to maximize the miles that you earn. Of course, all of these things are subject to change (and likely will change) at some point during 2014 as the program is merged with American AAdvantage, so if you are waiting to jump on any of these, now is the time to do so! Feel free to share any final comments below!